We learn best when we are doing things that matter to us. For the Digital Literacy for All Learners (DL4ALL) project, this means first meeting with different audiences to decide what creative works they would like to do and what digital technologies might be needed to do them. Digital literacy training is then embedded into those activities as needed, using an approach we call Demystifying Technology. Along the way we work to open up the black box that is hardware, software, and networks — and the ways values, beliefs, cultures, and policies shape and are shaped by technical artifacts — so as to advance informed use and co-creation of technologies in community, with community, for community. For a more in-depth overview of our program, see the image to the left, or download the DL4ALL Overview PDF. The goal of the Digital Literacy for ALL Learners project is to develop and share methods to foster digital literacy skills by employing a project- and capability-based approach rather than a more traditional approach of teaching skills like mousing and keyboarding. Those implementing our programs take into account the capabilities, values, and goals of individual students and guide them in solving problems that have personal meaning, using digital technologies as well as other tools. To read some of these stories, see our Stories page. We hope that this site is a meaningful resource for you and your community/organization to help foster digital literacy. Please see our Nuts and Bolts page for training resources, including training curriculum, kits, resources, videos and more. To see what theories and ideas inform our work, refer to the Fundamentals page. If you have an idea for a project; are interested in expanding programming to other sites; or have further interest in the project, please send us an email using the Contact Us link. 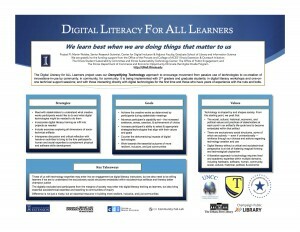 This project is coordinated through the Center for Digital Inclusion at the Graduate School of Library and Information Science, University of Illinois, Urbana-Champaign, and is funded in part by the Illinois Department of Commerce and Economic Opportunity “Eliminate the Digital Divide” program. Additional funding is provided by the University of Illinois Urbana Champaign Office of Public Engagement. With thanks to our major funders!